We use a unique process to create your personalize gift. The process incorporates special inks, papers, products, substrates, heat press, and computer programs. During the creation of your gift, the ink changes from a solid to a gas. Permanently creating the image on the gift. The process is called Dye Sublimation Printing. Sublimation is the change of state of a substance from a solid to a gas without first becoming liquid. An example is the vaporization of carbon dioxide (dry ice) at ordinary atmospheric pressure and temperature. Unlike conventional inks, sublimation inks are converted directly from a solid to a gas under heat and pressure, causing them to bond with the material. The molecules of ink revert to a solid state upon cooling, transferring the image (with no lost of quality) into the surface of the product. The image becomes part of the product. 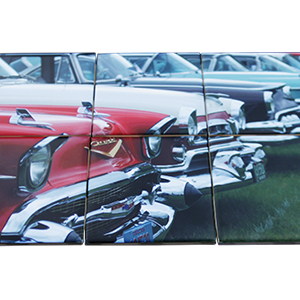 We use Dye Sublimation Printing to create all of our products from our studio. We believe this process is unmatched in quality. In fact, we are so confident that you will be happy with your order that we feature a 30 day money back guarantee.